What shape has a hexagonal top, a pentagonal bottom, and a triangle on its side? If you said a scutoid, we’d...well, we'd be pretty surprised. But you’re right! 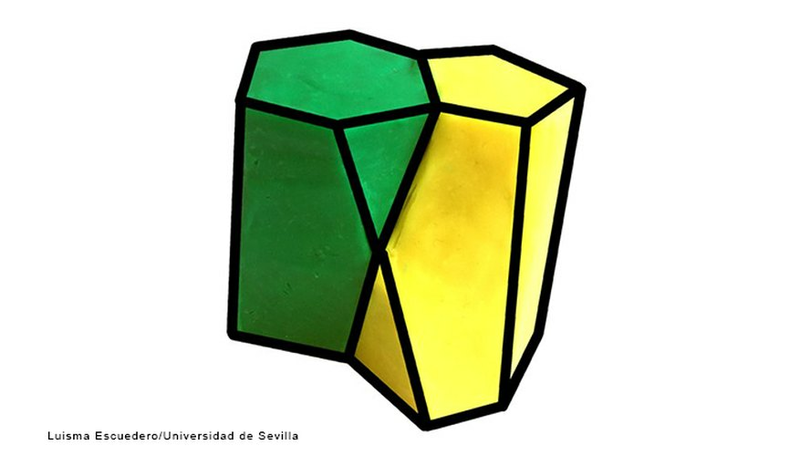 This week, a group of scientists from Spain, London and the U.S. unveiled the scutoid, a new eight-sided shape. With a hexagon on one side and a pentagon on the other, the scutoid looks like a prism with one corner chopped off – or like a twisted prism, depending who you ask. More than a theoretical geometric shape, scutoids exist throughout nature – even in your own body. Read on to learn about how this new shape helps explain why some of our tissues look the way they do, and how the discovery could even launch new medical discoveries. How did scientists discover the shape? The research team’s search for the scutoid started in a surprising place: biology. To be more exact, the research team set out to understand how animal cells can grow to create complex, curved structures like we see in nature – for example the curve of a beetle’s back. Can't really picture it? Think the stones that make up an arched doorway. The stones on the sides of the arch can have simple shapes, since the stones can lie flat on top of each other to go straight up and down. But the stones at the top need a more complex shape – wedge-shaped, with a longer top and a shorter bottom – to create actual arch. The same kind of principle holds true for cells. While a single layer of cells may be able to lie flat – for example, the outer layers of cells on your skin, or cells that grow flat on a plate in the lab – most of the structures in nature are more complex. So they require more complex cell shapes to create them. Knowing that some kind of cell shape would explain complex structures like salivary glands, the researchers used computer modelling to identify some candidates – and thus, the scutoid was born. When the researchers then looked for scutoids in nature, they found them. Scutoids make up a part of salivary glands – a structure where cells have to organize to form a hollow tube – and the researchers found scutoid-shaped cells in developing and in mature fruit fly tissues. Not surprisingly, the scutoid shapes are concentrated in areas where tissue is curved – but they aren't found in tissues that lay flat. While it’s easy to think of 3-D geometric modelling as theoretical – hey, neat, we know why a salivary gland looks like that! – it could be a breakthrough for health research. Scientists are always looking for ways to grow more realistic tissues in the lab, since it lets researchers do experiments in “lifelike” conditions without the expense (or potential ethical issues) of experimenting on animals. Learning more about how cells organize can help health researchers design more realistic experiments. It could also allow scientists to grow better organs and tissues in the lab, helping to pave the way for lab-grown organ transplants in the future. The bottom line? Pay attention in math. Someday, those geometry skills might save lives! Why Is the Study of Histology Important in Your Overall Understanding of Anatomy & Physiology? What Are the First Eukaryotic Fossils? Tremblay,, Sylvie. "Scientists Have Discovered a New Shape – And It's Pretty Weird." Sciencing, https://sciencing.com/scientists-have-discovered-a-new-shape-and-its-pretty-weird-13714211.html. 31 July 2018.